I always dress up my dog Oscar for Halloween! He loves it! This July, I got a second dog, Mya. So for Halloween this year, I wanted them to go as a paired couple. 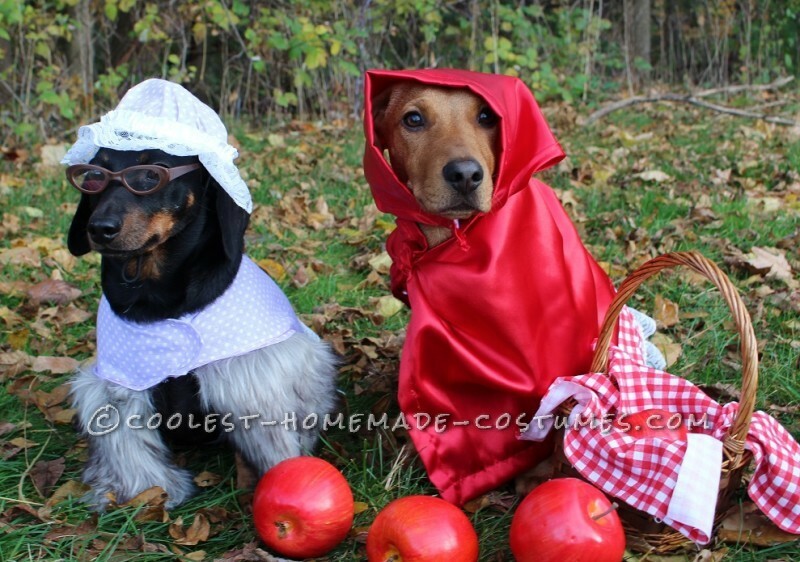 I didn’t really see much in the stores for “coupled” dog costumes. So, I decided to make my own. A few ideas came to mind, but the idea I liked best was Little Red Riding Hood and the Wolf. 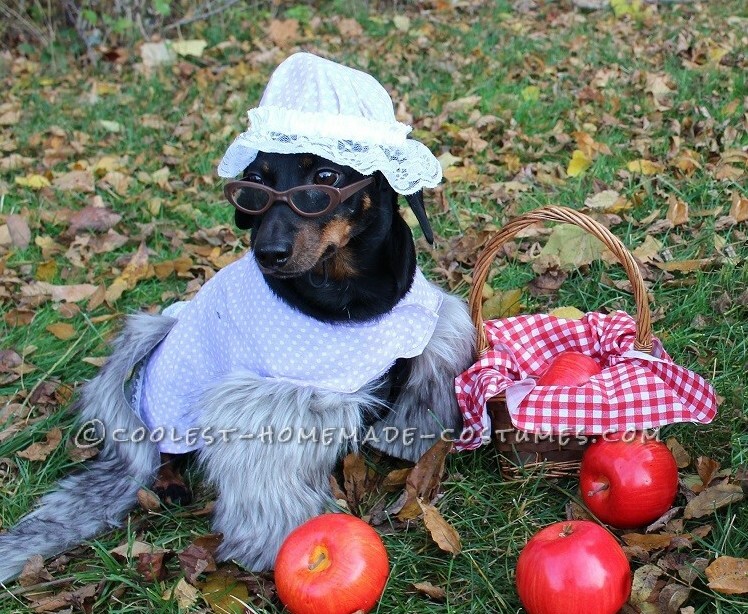 To make it more unique, I thought I would dress my boy dog Oscar as the wolf disguised as Little Red Riding Hood’s grandmother. It was the perfect idea. I just had to execute it. I had the idea in my head and I was hoping that it would come together as planned. And after hours of effort, it was a success! I am pretty crafty, and am good with a sewing machine; so it wasn’t too difficult. The most difficult part was measuring my dogs to get the right fit. That was tricky, especially when I tried to measure my 5 month old puppy! I went to the local fabric store for the supplies. I tried to find a typical “grandmother” print. I found a cute purple polka dot fabric. Purple was my grandmother’s favorite color, so I decided to go with that, in honor of my grandma who loved my dogs. I also found some grey fur which I thought would be perfect for the tail of the wolf and the front legs of the costume. I made the dress first. The dress had a strap to go around the neck that was fastened with Velcro and a strap that went around the belly that was also secured with velcro. I also added white lace to the base of the dress. Once the dress was complete, I needed to add the fur tail and the fur legs. I sewed the tail onto the back of the dress. I sewed the legs onto the front part of the dress. The dress was designed for the dog to step into the fur legs that were attached to the dress. There was no Velcro added to the legs of the dress; they were sewn directly onto the dress, and sewn shut. At first, I tried having the costume style be that the fur wrapped around the dogs legs and then was secured with Velcro, but whenever Oscar would walk, the Velcro came apart and the legs opened up. So I designed the costume to have the legs sewn shut, and for the dog to step directly into the legs of the costume in order to put it on. For the hat, I had a hat from a previous costume that I used as a guide. I sewed the purple fabric on top of the old hat, and added the same white lace that I used on the dress as a cute addition to the hat. In the doll section of the craft store, I found a perfect pair of glasses that fit my dog and they became the perfect accessory to the costume. 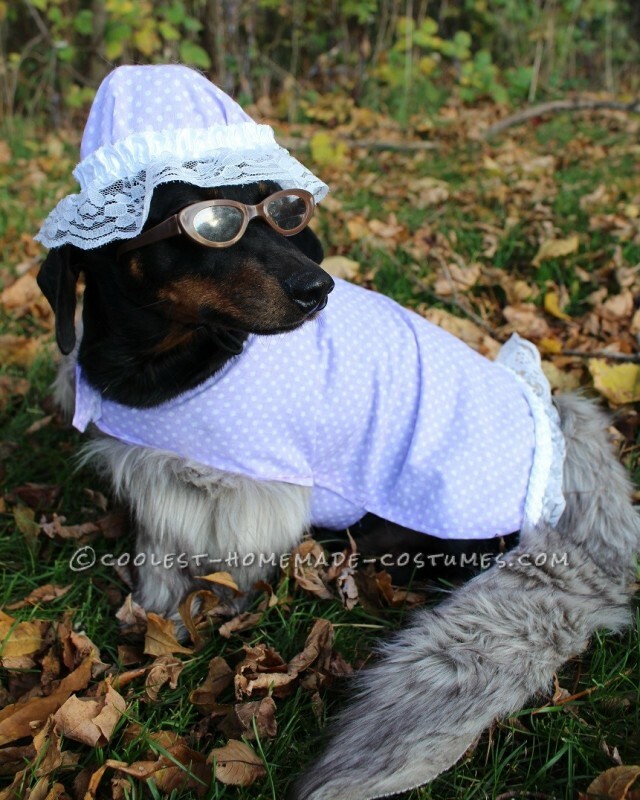 Overall, the costume took me about 3 hours to make, and again, the hardest part for me was measuring my dog to make sure the costume fit perfectly. Adding the fur legs was a challenge at first, but in the end, I made it work perfectly. Overall, I was super pleased with the finished product and I am super proud of myself! A local restaurant had a “hallo-weenie” party with all dachshund dogs. When Oscar and Mya arrived, everyone loved their costumes! We got a lot of laughs, and everyone tried to take a picture of them. Everyone seemed to be amazed that Oscar kept the glasses on. Also, people asked me where I found the costumes, and when I told them that I made them, they were even more amazed. They said they would never have the patience to do something like that. And they also thought they were store bought, which made me feel pretty good about all my hard work. We also took second place at a local Petco this year!